It's about time to rattle off a few Cataclysm plot predictions, mostly because it's fun to look back on later and laugh at how wrong they often were. Spoilers, obviously. Most of this is guesswork but some of it is based off things that have been confirmed by Blizzard, so read no further if you're intentionally keeping yourself in the dark! The big one! A recent WoW.com article about some upcoming Cataclysm events confirmed that come the expansion, much-despised warmonger Garrosh Hellscream will be taking over the reins of Warchief from Thrall and executing Cairne for treason. Now, I'm not sure if I missed this earlier, but while it was pretty assumed Cairne would die (there's been numerous hints indicating his son Baine will be the Tauren leader eventually), I always thought it would be a political coup or subtle working, maybe something by the Grimtotem, maybe an assassination. But a flat-out execution? For TREASON? Yeah, I don't see this sitting well with the rest of the Horde. Especially the trolls, who are already close with the Tauren due to their shamanistic roots & ties to nature, and will be feeling even more kinship due to their newly-discovered druidic abilities. As for Garrosh? I think the execution will completely divide the Horde, and a major, major part of the Cataclysm Horde storyline will be about Garrosh further ostracizing all his supporters until it's only him left against the proverbial angry lynch mob. I think it is at this point we'll see things come full circle and Garrosh go down a familiar path...drinking demon blood. Remember, Garrosh is a brown, fresh-from-Nagrand orc. He never drank the demon blood himself, nor is he directly descended from Azerothian, demon-tainted parents (his father Grom drank the blood after Garrosh was already born.) He idolizes Grom, and sees everything that the "old Horde" did as justified and correct, from their warlike nature to their bloodlust and penchant for violence. Also, let's be honest. Garrosh is pretty stupid. He'd be easily manipulated by sugary demonic whisperings. Oh look, how convenient that the dead body of Mannoroth sits right outside his throne room as a daily reminder of where he can find such power! At least then we'll (hopefully) be able to kill him. There's been some great discussion about the connection between the Tauren and the Earth Mother, and using the power of the Sun instead of the Moon. This all seems pretty logical, but I think we'll see another, more obvious reason that the Tauren will be harnessing the Light: retribution. We've never really seen the Tauren mad. Throughout all of WoW they tend to be the calm race, the peaceful giants, the gentle warriors. But the execution of their beloved leader at the hands of a hot-headed tyrant? I think the kid gloves are coming off and the Tauren will be on the warpath come Cataclysm. Garrosh is a bully, but he's been pushing around the diplomatic Thrall and the smaller-stature Varian. 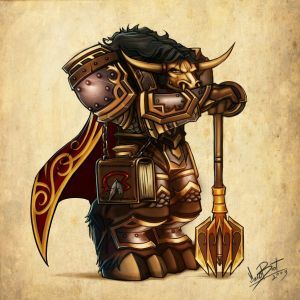 How will he hold up against a towering Tauren ready to smite his face into the ground? I foresee a lot less nature & flowers and a lot more Earth Mother Said Knock You Out. The Night Elves, on the other hand, are stable, comfortable, and have no real issues other than excessive lipcurl sneers...so naturally they are going to welcome the one thing that's nearly destroyed them at least twice before. Not to mention that many naturalists in Night Elf culture would see using arcane power as blasphemous and offensive. Oh and the fact that every time they delve into the arcane THINGS GO TERRIBLY WRONG. What's next? Maybe we'll see Jaina petitioning the Dalaran Council of Mages to start studying Necromancy? Might as well, right? I mean, what's the harm? This entry was posted on Wednesday, March 31, 2010 at 11:11 AM and is filed under lore,npc spotlight,predictions. You can follow any responses to this entry through the RSS 2.0 feed. You can leave a response. I'm still not sure how they're going to work out the Night Elves becoming mages thing... but I'm guessing that since you're all Hordeish maybe you haven't stood around in Darnassus listening to Archmage Mordent Evenshade arguing with the Sentinel guard. The reception he's getting... is not a warm one. I think that if some Night Elves begin to practice magic again like the Shen'dralar they're going to be more or less ostracized by Kaldorei society in general. The whole "no magic" thing is pretty firmly understood. And they're long-lived people. They change slooowwwwwly or not at all. Also, HOLY WRATH Tauren is making me happy. Tauren paladins are going to be very interesting. I may have to make a night elf just so I can hear this conversation! (I can read it but I think I'll want to check it out ingame.) It just seemed so weird to me that suddenly they were going to embrace magic again, despite the many bad experiences their society has had when dealing with it. I just hope they come up with a good reason for utilizing arcane magic again, because right now I don't see any huge threat or necessity that would explain it.